Having just written about our lunch yesterday at Rover’s, I need to add a post about the meal we just had at home that was every bit as good, thanks to Joel and Gail. You can see it above. Joel made the entrée, Masitas de Puerco, using the recipe he found at a blog called Cuban in the Midwest, which in turn credits epicurean.com. He prepared the marinade yesterday, mixing together garlic, chopped onion, orange juice, olive oil, oregano, cumin and salt, and letting this sit overnight in the refrigerator along with the pork chunks. Today, he cooked it up with sautéed onions. 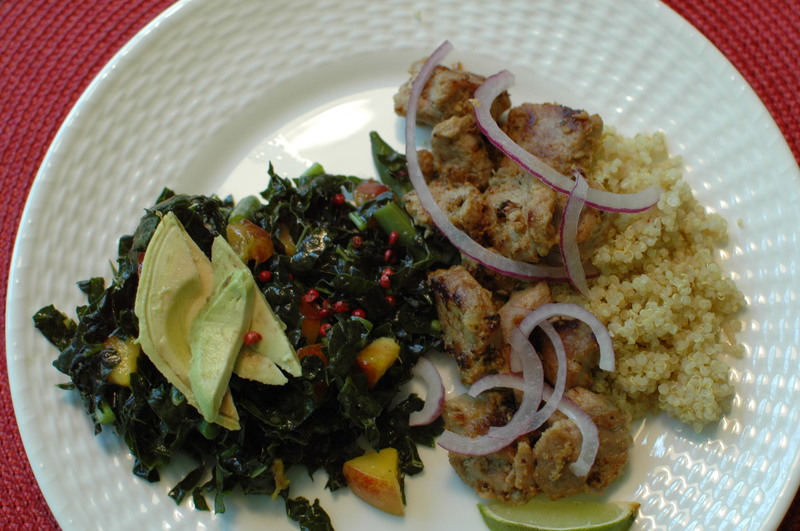 To complement the masitas, Gail prepared a massaged kale salad. She cut the kale into thin ribbons and rubbed salt into the leaves, altering both the flavor and the texture. Then she added nectarine pieces, green beans, and a lemon vinaigrette. Although the recipe didn’t call for it, she also added pink peppercorns. And avocado, as you can plainly see. The result in both cases was a sublime mix of flavors. We’ve had some pretty good meals lately, but none better than this.